In the wake of the Isla Vista shootings and stabbings that took the lives of six UCSB students, SAE was retained by Santa Barbara County to provide immediate counsel regarding its crisis response. A particular need was to assist mental health professionals explain to the national media — including an interview for the 20/20 Barbara Walters special with the killer’s father – the county’s procedures, protocols and systems while protecting the confidentiality of those involved in this incident and others. We worked one-on-one with the County’s spokespersons, including determining the best messages, finding the words that were most comfortable for the executive, conducting message delivery training and working through a mock media interview. 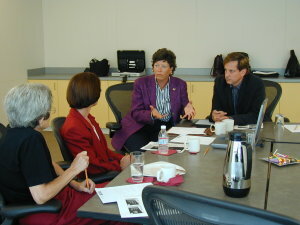 SAE works with senior executives from throughout the Western United States. One example was assisting the City of San Jose City Manager to discuss a particularly sensitive issue and how to discuss the topic, taking into account a variety of audiences. Each stakeholder would “hear” the City Manager’s comments in a different way. Through capturing the most salient points to convey (what we call “Key Messages”), converting them into the words and phrases that each audience would understand, and then practicing on-camera the delivery of each message, we helped to ensure the best possible outcome.